Top social science researcher Dr Cathy Gormley-Heenan today received a Distinguished Research Fellowship from the University of Ulster in recognition of the quality of her contribution to knowledge in her field. In the space of four years Dr Gormley-Heenan has risen from a junior lectureship to senior lecturer, to the directorship of one of the largest Research Institutes within the University (Institute for Research in Social Sciences). She has had one single authored research monograph and two co-authored edited collections published in that time, as well as a series of journal articles and reports, demonstrating her sound abilities as both a lone researcher and a collaborator with colleagues across the UK and internationally. 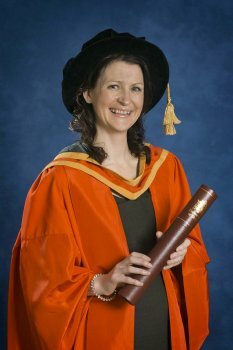 Dr Gormley-Heenan has been guest editor of special issues for three journals, sits on the editorial board of Politics (a long-established Wiley-Blackwell journal) and State Crime (a new title from Pluto Press) and has become a member of the Economic and Social Research Council’s (ESRC) Peer Review College. She has also recently been elected to the national executive committee of the Political Studies Association (PSA) and masterminded the 2012 Political Studies Association’s Annual Conference in Belfast which attracted more than 500 delegates and keynote speakers including David Blunkett MP, John Bercow MP, Speaker of the House of Commons and Baroness D’Souza, Speaker of the House of Lords. She is currently working in partnership with the Research and Information Service at Stormont (RAiSE) to deliver their 2012-13 Knowledge-Exchange Seminar Series. As part of the RAiSE partnership, Dr Gormley-Heenan presented her most recent research on public attitudes to peace walls to an audience of MLAs, civil servants and practitioners at Stormont, serving to underscore the real-world impact of her work.